Welcome to Fiddler’s Green Amphitheatre. Get to know Fiddler’s Green Amphitheatre. Fiddler’s Green Amphitheatre was designed as a large-scale earth sculpture with rolling grassy slopes and spectacular Rocky Mountain views. Originally built to host community festivals and symphonic music, it was commissioned by the Museum of Outdoor Arts in 1982 and designed by renowned landscape architect George Hargreaves. Fiddler’s Green Amphitheatre received a national award for design the following year from the AIA. With a seating capacity of 17,000 people, and optimum stage, sound and lighting systems available, Fiddler’s Green is unrivaled in Colorado for its ability to present the leading musical talent on the performing circuit. The amphitheater has grown to incorporate the Museum of Outdoor Arts mission of “making art a part of everyday life” through the merging of architectural, artistic and landscape development concepts. The adjacent Marjorie Park hosts a variety of artistic offerings viewable to the public and patrons of the amphitheatre hosted by the Museum of Outdoor Arts. With over 200,000 annual visitors attending concerts ranging from contemporary to classical, Fiddler's Green has developed into a popular setting for any music showcase or event. It is a unique venue to enjoy a night under the stars, music with friends, and the breathtaking views. 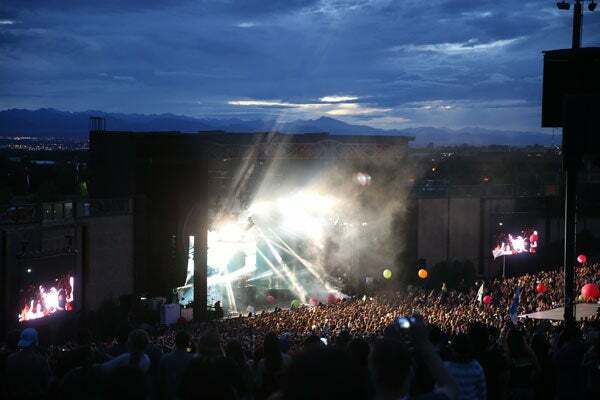 Fiddler’s Green Amphitheatre is operated by AEG Presents and MOA. AEG Presents, the nation's second-largest concert promotion and touring company, is comprised of special event, broadcast and exhibition divisions, fourteen regional offices, and numerous state-of-the-art venues nationwide. AEG Presents has an international reach with regional and local presence in San Diego, New York, Las Vegas, London, Nashville, Houston, Dallas, St. Louis, Atlanta, Denver, San Francisco, Florida, and Los Angeles.